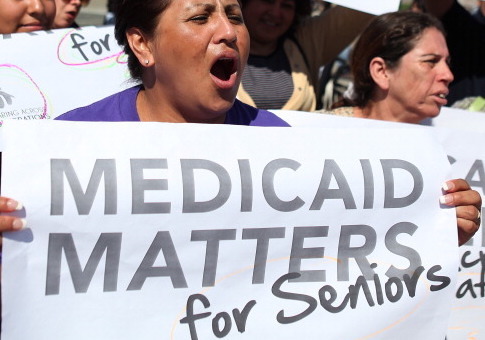 "Medicaid was designed as a safety net for the truly vulnerable—the elderly and individuals with disabilities," the foundation explains. "Because these groups were generally either not working age or had limited work capacity due to their disabilities, work requirements and time limits were never included in the Medicaid program. But over time, the program has grown to cover new groups, changing the fabric of the program and creating new challenges for policymakers and enrollees alike." The report finds that only 16 percent of those enrolled in Medicaid work full-time for the duration of the year. More than half—52 percent—do not work at all, and 32 percent of Medicaid enrollees work part-time or for part of the year. "Despite the fact that Medicaid's able-bodied adults have no physical disabilities keeping them from pursuing gainful employment, very few actually work full-time jobs," the report states. "According to the Census Bureau, most non-disabled adults on Medicaid do not work at all." In some states, the percentage of those enrolled in Medicaid that are not holding a job are even higher. For example, in Nevada, 60 percent of Medicaid enrollees are not working. In New Hampshire, 58 percent are not working. And in Ohio, 57 percent are not working. The surge in enrollment has also led to a huge increase in Medicaid spending, leaving fewer funds for the truly vulnerable who need the program or other aspects of the budget such as education, infrastructure, and public safety. In 2000, Medicaid spending totaled $206 billion. Next year, taxpayers are expected to spend $633 billion on the program—an increase of 207 percent. For able-bodied workers, federal spending has increased at an even faster pace. In 2000, $19 billion was spent on able-bodied Medicaid enrollees and has increased by more than 700 percent to a projected $158 billion for 2018. "The implications of this Medicaid explosion are clear: Fewer dollars are available for truly vulnerable individuals who depend on the Medicaid program to survive," the report states. "Fewer dollars are available for important budget priorities like infrastructure, law enforcement, and education. Taxpayers are on the hook for an ever-increasing bill, with no end in sight." To help solve these problems, the Foundation for Government Accountability says work requirements should be implemented in the Medicaid program. "FGA's past research has shown that the most effective way to free people from the trap of dependency is through work—and Medicaid should be no exception," said Nic Horton, research director at the foundation. "Since 2000, the number of people enrolled in Medicaid has more than doubled. Total Medicaid spending has nearly tripled since 2000, and spending on able-bodied adults has increased by an astonishing 700 percent. Not only is this unsustainable, but it's limiting our ability to help the truly needy." "We know work requirements work," said Jonathan Ingram, vice president of research at the foundation. "We've seen them work in Kansas, and Maine, and in states across the nation. When able-bodied adults gain their independence through work, their incomes skyrocket and they're able to free themselves from government dependence. It's past time for the federal government to empower states to enact Medicaid work requirements." This entry was posted in Issues and tagged Health Care, Medicaid, Unemployment. Bookmark the permalink.